After saving themselves and their fellow students from a life pitched against one another, Sophie and Agatha are back home again, living happily ever after. But life isn't exactly a fairytale. When Agatha secretly wishes she'd chosen a different happy ending with Prince Tedros, the gates to the School for Good and Evil open once again. But Good and Evil are no longer enemies and Princes and Princesses may not be what they seem, as new bonds form and old ones shatter. I gave this book 4 stars. I didn't exactly like it as much as the first, but I still did really enjoy it. The characters are kind of outrageous, but then again, this is a middle grade, so they're kind of at the age of being ridiculous. I loved the plot and the world was just as cool as ever. 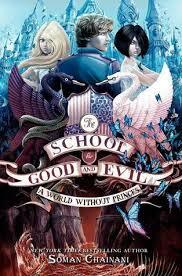 So the schools are no longer Good and Evil, but are now Girls and Boys. This added a whole new dynamic. The girls are taught that they don't have to be less than men, and men are taught to get revenge. They resent that the girls no longer want or need the happily ever after aspect of their lives. I thought that this was a great plot line. Sophie is still completely ridiculous, but I like her a lot more in this book. I feel like she has grown up a lot since the first book. Now, at the end where she chose the evil school master, she went back a few steps, but I can see why. She's scared of being alone and not having anyone love her. She misunderstood what happened between her parents, or so I hope, and overreacted to it. This just shows that she is in fact human. She isn't evil, she is just scared about the future. What I loved about this book is that it felt like a fairytale. The entire book led up to the ever-present climax that is in every fairytale ever. All the magic elements and the doubt and the mystery that just builds and builds and builds, trying to get to that happy ending. What I found most frustrating about this book was the misunderstandings. The characters just assumed so much and would never talk to each other and clear the air. Agatha just assumed that Sophie was turning evil again, Tedros just assumed that Agatha was teaming up with Sophie to be evil. It just boggled my mind that this was happening. I guess it had to be there though, to drive the plot, that doesn't mean I liked it. I think the author did an amazing job of world building. Since this is the second book, you wouldn't really expect the world building to be happening in this book, but there was quite a bit. Because of the shift in the schools, there were all these new rules and stories that were integrated into the plot. They were teaching different morals at these schools that used to be Good and Evil. Overall, a steady read. I finished it relatively quickly and had a good time doing. Although, I was a bit upset by the ending, I'm not holding that against the book. I can't wait to get my hands on the last book!